Spider-Man knows his target audience! If you're like me- and heaven help you if you are- when you think about Spider-Man, you think "superhero," then "man, it took them long enough to start making a decent movie." Then you think "How can I maximize profits by hard targeting advertising to my primary interest groups?" These four panels were part of a full-page ad in the back of Web of Spider-Man #1, cover dated October 1985. 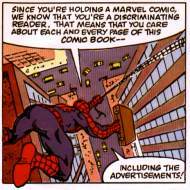 Panel One: Spider-Man, web-slinging while carry a briefcase, says that discriminating readers care about the advertisements in comic books. Apparently, the people creating the ads aren't as discriminating. Look at Spidey's legs- no "graphic foreshortening" excuse is strong enough to explain that huge, lumpy right leg. 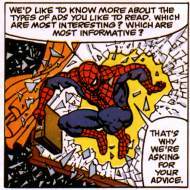 Panel Two: Spidey, still with case, breaks a window with his head- apparently, the contents of the briefcase are to valuable to use as a shield- while asking you about your favorite kinds of ads. 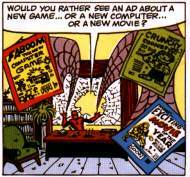 Panel Three: Spidey sits at the desk in front of the window he broke and shoots three ad examples at the viewer: "Faboom the Computer Game," "Crunchy Cookies," and my favorite, "Exciting Movie of the Year." These are in case children don't know what an advertisement is. 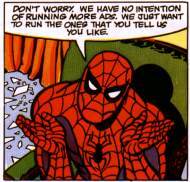 Panel Four: Spidey assures us that Marvel won't use the information to put more ads in the comics. I thought this would turn out to be untrue, but a count of the ads in this comic and Captain Marvel #15 (which was released in January of 2001) show the ad-to-content ratio to be almost exactly the same. Now, Spidey acting as a market research drone is bad enough- but the worst part of the ad was the bottom, a short survey you had to cut out and pay to send in! "Hey Kids! Wreck your comic, and pay us to be a part of a survey!" Fun Fun Fun! I hope they work this story into the movie. Also: you may have seen that image somewhere else, but I originally scanned it. Marvel Comics. I am a free man.